HomeInternetAmazon.de – Now also in English and Dutch! Amazon.de – Now also in English and Dutch! I do understand some German, but I am far more relaxed if I visit a website in English. That is why I was so happy to notice that Amazon.de is also available in English. And brand new since late in 2016 is that you can also access Amazon.de in Dutch! For a long time and since its start Amazon.de has only been available in German, but now that has changed, probably due to the large amount of people in Europe using Amazon.de and since lots of these people have little to no German knowledge they decided to make Amazon.de available in English as well. So, if you are located in some other nation in Europe and want to shop from Amazon.de which can be useful, especially considering that it is quite cheaper than shopping in the UK Amazon Store, then this has just been made much easier! I have done this lots of times myself by the time this article is published, and it is really nice. And especially as I use this together with the mail forwarding service named Mailboxde which you can read a review of right here. 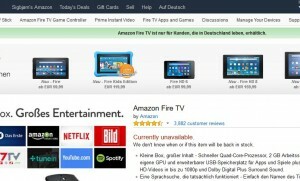 I hope you have found this information to be useful, and that you will have a great time surfing Amazon.de and reading about the different products available there in English. And since September in 2016 you can also shop from Amazon.de in Dutch, meaning that the Dutch shoppers can read item descriptions and much more in Dutch. That comes quite useful, even though the Dutch language is fairly similar to both English and German. But, there is something about doing the shopping in your own language, and I have no problem understanding that it is much better doing so in your own language! Have fun shopping on Amazon.de in English or shopping at Amazon.de in Dutch! Since I originally wrote this article Amazon.de has improved even more. You can now visit Amazon.de not only in English and Dutch, but you can also shop from the German Amazon Store in Polish and Turkish. Doesn’t that sound cool? Have you got any question or comment or experience shopping from Amazon.de in English, Dutch or maybe in German? Write a comment and let me know! If i shop from a country in europe from amazon.de, can they still charge me for import fees? No, not as long as it is a member of the EU. if I shop from amazon.de as a dutchman, can they still charge me for import fees? I live in Canada but want to send a gift card of euros to my Granddaughter in Germany; Can I do this?